Windows 8 was released for a while but Microsoft hasn’t made the download links of the Windows 8 available yet. Sometimes you will need the ISO files to re-install Windows when your computer doesn’t work properly. 1. Make sure you are running on the Windows version corresponding with the version of your desired Windows ISO file. 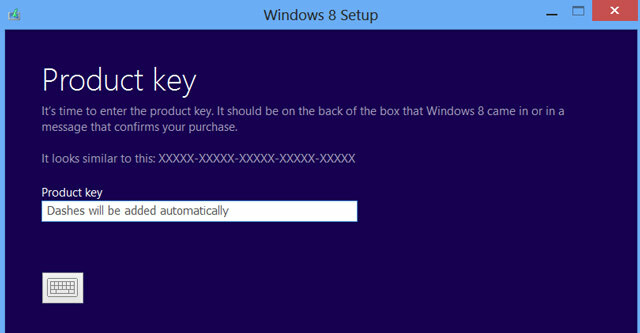 For example, if you need to download the Windows 8 64-bit, you will need to run on a 64-bit machine. The step is very important because you don’t have the option to choose between 32-bit and 64-bit version. Microsoft detects the version based on the machine on which you run their setup tool. 2. Download and install Windows 8 Setup program. 4. Fill in the product key you received via email, then click on Next. 5. The program will detect your Windows 8 version, click on Next to start downloading. 6. After finished, you will see some options including Install now, Install by creating media and Install later from your desktop. Choose Install by creating media. 7. On the next screen, choose ISO file to start creating your Windows 8 ISO file. Click on Save to save it to your computer. 8. Wait a few minutes until the process completes and you have the 32-bit or 64-bit Windows 8 ISO file now.